Portsmouth could receive a windfall of nearly £1m from Liverpool if they win the Premier League title. 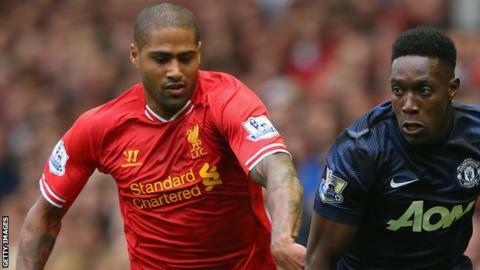 The club inserted a special clause into Glen Johnson's contract when he left Fratton Park for Anfield in 2009. Johnson, 29, joined Pompey from Chelsea in 2007 following a successful loan spell, with Liverpool paying £17.5m for the right-back two years later. The money would be a boost for the League Two club, who have twice been in administration in the last four years. The only potential obstacle to them receiving it would be that they have effectively been reformed as a result of the periods in administration and ownership has changed from Portsmouth City Football Club, when the Johnson sale went through, to Portsmouth Community Football Club. The 'title-win clause' was most likely a decision by Portsmouth's then chief executive Peter Storrie. However, when contacted by BBC Sport, Storrie said he did not recall inserting it, but added such a clause was not uncommon. The club, taken over last April by the Pompey Supporters' Trust, which owns a stake of about 51%, said it was not its policy to comment on players' contracts, but a source at Liverpool confirmed the clause exists. Liverpool are top of the Premier League with six games left, while Portsmouth are 21st in League Two, just five points above the relegation places, having dispensed with manager Richie Barker last week. Speaking to BBC Late Kick Off South, Pompey chairman Iain McInnes also declined to comment on the Johnson clause, but insisted the finances of the club are now in good health. "Financially and generally off the pitch we have over-performed," he said. "On the pitch we have under-performed."